So I was given a rad gift by my co-worker who recently took a trip to the Netherlands. Flanders, which since its partition has straddled both Belgium and the Netherlands, is the home of jenever (genever in Holland, genèbre in Belgium and genever in the UK; traditionally also called Schiedam or Dutch Gin). Genever's origins are attributed to Franciscus Sylvius, a professor of medicine at Leiden University, whose distillation of the spirit was first recorded in 1572. However, some publications mention de Boe, another 17th-century professor at Leiden, as inventor of the 'eau de vie de genivre'. During the 14th century, when the Black Death reigned in Europe, monks discovered that the juniper berry was effective against kidney and bladder diseases, and that it might cure prostate problems and strengthen the immune system. Based on these records, Sylvius produced an inexpensive medicine by distilling the juniper berries with spirits. In only three years, Sylvius' all-purpose medicinal drink became a popular social drink in Holland, so much so that French philosopher and encyclopedist Denis Diderot (171384) described the Dutch of this time as 'living alembics, distilling themselves'. Among the first distilleries founded were Bols in 1575, de Kuyper in 1675 and Wennecker in 1693. Many more followed. English mercenaries who had fought for the Dutch in the Thirty Years War and returned from the Low Countries introduced genever, which they called gin, to England. They had used genever to overcome fear before entering the battlefield, hence the expression 'Dutch courage'. In England  like in Holland before it  gin became so popular that its excessive consumption presented a social problem, as depicted in Hogarth's famous engraving Gin Lane. Until the Napoleonic wars, genever was the only gin produced, and it was produced only along the waterways and coast of Flanders. Some 85% of genever production was exported, mainly to England, France, Spain, North America, the West Indies and Africa. But the Continental Blockade disrupted this lucrative trade, and new distilleries were established in foreign countries to fill the needs previously met by imports from Flanders. After the Napoleonic wars these companies provided sharp competition for the export of genever. Distillation techniques improved with the newly introduced continuous still. To reduce production costs, instead of distilling malt or other suitable grains like rye or wheat, cost-efficient industrial spirits were made from cheaper organic materials such as molasses, the by-product of sugar production from sugar cane or sugar beets, or corn, which has always been cheaper than other grain. These new industrial spirits were neutral in flavour, lacking the malty taste of the alcohol made from distilling fermented malt. With the use of these neutral spirits, the traditional style of genever could not be maintained, and a new style evolved. However, due to lower production costs and lower excise duties, genever became cheaper and more popular in Flanders than the imported French brandy (also a Dutch invention!) or the omnipresent beer. 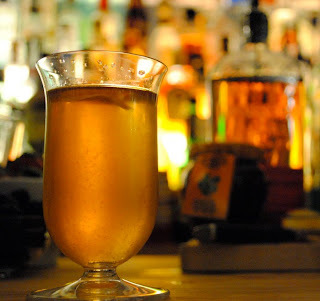 Between 1800 and 1820, genever ousted beer as the national drink in the Low Countries. On the continent genever, like kmmel, aquavit or schnapps, is consumed as a digestive, as a chaser between beers or food courses, or as a social drink. No such custom exists in the UK, where genever is known virtually only to sommeliers and the trade. The last public trace of genever in the UK, a lonely entry for Filliers in the gin section of the Harpers Wine and Spirit Directory 2004, has now disappeared with the 2005 edition. Quod non est in actu non est in mundo (What is not on paper does not exist). What a pity. European Regulation number 1576/89 states that 'genever is a distilled beverage obtained when ethyl alcohol, from agricultural products and/or grain spirits and/or grain distillation, is flavoured with juniper berries& The taste of the juniper berry is not required to be perceptible in these products.' Thus the use of spirits derived from potatoes, sugar beets, grapes or wine is permitted. But an alcoholic drink cannot be sold as genever unless juniper berries, or juniper-berry flavouring, have been added during production. If juniper berries have not been used, the product will be sold as an aquavit, or as a korn (grain) or a kmmel (caraway) in Germany. 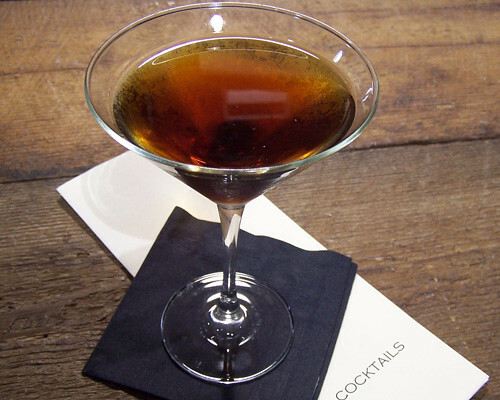 If made exclusively from grain alcohol, the product may be marketed as roggen (rye) or korenwijn (grain spirit). Traditional genever is still made from barley, rye or wheat. For high-quality genevers of the traditional style, the percentage of barley is high. 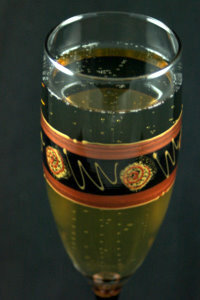 Genever made with corn or rice, and nowadays with neutral industrial alcohol, is considered to be of inferior quality. First the grain is ground, mashed and fermented to make beer, which is then distilled (first distillation) to make 'maltwine'. Nowadays the majority of genever producers buy the maltwine from big distilleries. In both Holland and Belgium, only two producers of genever are left who still produce maltwine. Those distilleries that make or once made their own maltwine are called branderijs in Holland and stokerijs in Belgium. The producers who have always bought maltwine and neutral alcohols call themselves 'distilleries'. For the second distillation, the maltwine is mixed with juniper berries and other botanicals, such as orris, gentian, angelica, licorice roots, lemon and orange peel, cassia bark, caraway, coriander, cardamom, anise or fennel. Each producer has his own secret formula, and triple distillation is quite common. If triple distillation takes place, only the juniper berries are introduced in the second distillation. The other flavouring agents will either be added to the third or even fourth distillation, or the alcoholic vapour may pass through a layer of herbs before condensation. Prior to bottling, the distillate is diluted to an alcoholic content of 3050%. Other flavouring agents may also be added at this stage. For many centuries, genever was stored and shipped in wooden vessels, as people realised that the quality of the spirit was enhanced by letting it mature in oak casks. Today most high-quality genevers of the traditional style are matured in casks for a number of years to give them a rounder and softer flavour. To keep production costs low, many producers avoid distillation, working as blenders only. This method of production is called the 'cold method'. They buy grain alcohol for their better products and neutral alcohol for the cheaper brands, dilute it with water and flavour it with a herbal extract. If the extract is obtained by distillation of juniper berries, herbs and spices in a still, it is called 'esprit'. If produced without any distillation, the extract is called a 'tincture', obtained either by maceration (soaking in alcohol) of the flavouring ingredients, or by infusion (brewing as for tea). This process is well known from the production of bitters and liqueurs. It works because neutral alcohol absorbs the colour, flavour and taste of any herbs, spices, roots, fruits and seeds. Top-quality genever can be made in this way if top-quality ingredients are used. The northern part of Flanders, which forms part of today's Netherlands, was the cradle of genever production, and once had 13 malting houses and almost 400 distilleries in the town of Schiedam alone. Nowadays about 20 producers of genever can be found in the Netherlands. Only two of them, Bols and UTO Nederland, make their own maltwine. De Kuyper, Wennecker and Nolet are the other producers with a reputation for high quality and purchase their maltwine for further distillation with botanics. In volume of production and export, Bols is by far the most important Dutch producer of genever. In Belgium there are about 20 distilleries producing some 150 name-brand genevers. Two of the distilleries, Van Damme and Filliers, make their own maltwine. The other producers buy in their maltwine. In 1990 the producers of the traditional genever in East Flanders (Belgium) created an Association of Master Distillers with the aim of safeguarding the quality of their genever and promoting it. The provincial authorities supported this move by establishing a quality stamp, O'de Flander, for their products. This name refers to eau de vie and can also be interpreted to mean 'ode to the distillers'. To obtain O'de Flander status, the genever must comply with a number of requirements and must undergo a rsonance magntique nuclaire (RNM) test, which shows the base material of the alcohol used. There are now 11 members of the association. The best-known producers with the O'de Flander stamp of approval for all or part of their production are Braeckman, Bruggeman, Filliers, Rubbens, Van Damme, Van Der Schueren (VDS) and Van Hoorebeke (Fourcroy-Renglet). Some of the other reputable producers of Belgian genever are located outside East Flanders, such as in Radermacher, in a German-speaking enclave in the east of the country. Although genever is an ideal digestive, and even better as a trou Normand between courses, these continental customs have never been adopted in the UK. In Flanders genever is also for family celebrations. However, in Flanders and all over western Europe, the consumption of traditional genever, as with all other dry spirits, has gone down, as drivers shy away from drinks high in alcohol. The younger generation prefer long drinks, and neutral or flavoured vodkas are very popular, since they are so well suited to the fashionable mixed drinks. Traditional genever is unsuited for mixing with tonics or juices, or jonge with vermouth in a Martini. On the other hand, jonge is a good mixer and could appeal to the younger generation. Instead of promoting jonge, producers do the mixing of the final drink themselves. To get a share of the market, they offer a wide range of fruit-flavoured drinks. Jonge is flavoured with sugar and fruit concentrate, and the alcohol level is brought down to around 20% so that these drinks can be sold without an alcohol licence. Happy Holidays Everyone! Thanks again for getting in the writing mood and sharing. Here's the roundup for MxMo December 2009. Edward over at Wordsmithing Pantagruel made some people go bananas with the notion of Monkey drinks, but that wasn't the case. I say he petitions Paul for the theme Simian Sips sometime in 2010. Hey took fat washing to another place with a Vieux Gras with Foie Gras-Infused Cognac. Citations and footnotes aside, I haven't made her a drink yet, but we've chatted on the same side of the stick several times and Stevi Deter at Two at the Most offers up a recipe that truly has me green with envy. The Vanilla Whiskey Royale sounds delicious. I missed last weekendsHouse Spirits Distillery open house due to work and I really want a bottle of each.... even the white dog Stevi missed. Paul Clarke at Cocktail Chronicles is the overlord and supreme deity in the MxMo galaxy and he blessed/cursed me with this months roundup, and since it was late to begin with, and I'm late in writing, and he thinks blogger has a problem with its timestamp.... everything is fine. Paul went East India and waxes poetic about growing up and being weened on Lucerne. I Can attest that Paul Flinton at Ganymeda is true to his blogger tagline of making his liver work for a living. He is a national man of mystery and always comes and goes as he pleases..... no matter how much Fernet I throw his way. What can I say, He's an old fashioned kinda guy. Kevin Gray at Cocktail Enthusiast is preaching to the choir here, but for those of you who don't know the powers of a French 75 on a hazy morning during brunch are sorely out of sorts. 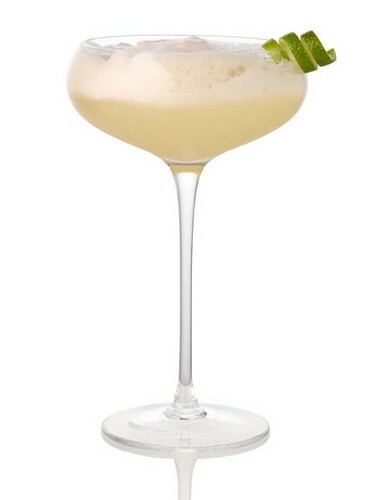 To qoute "Composed of gin, fresh lemon juice, simple syrup and Champagne, the French 75 is a light, refreshing cocktail that subdues the wary gin-drinker while still packing a sizeable boozy wallop. This tart, tasty concoction has made even the most dubious skeptic rethink their distaste for gin, without alienating fans of the spirit. " The highlights include a lot of brown spirits: Katie Loeb's fine Manhattan with Michter's Rye and Carpano Antica, Andy Arrington's fine Manhattan with George T. Stagg and -- yes -- Carpano Antica, Dave Viola's Rob Roy with Macallan cask strength and my Rum Old Fashioned with Inner Circle Green and Jerry Thomas Decanter bitters. 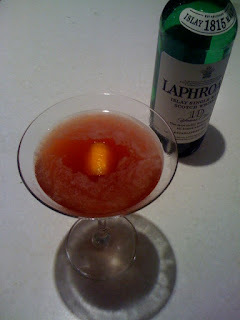 Dave then offered up a Hemingway Daiquiri with Rhum JM 1997, and I wrapped with a Marteau absinthe Gasper: yum. Felicia over at Felicia's Speakeasy thinks Eggnog ( I say that it's one word ) is money during the holidays. 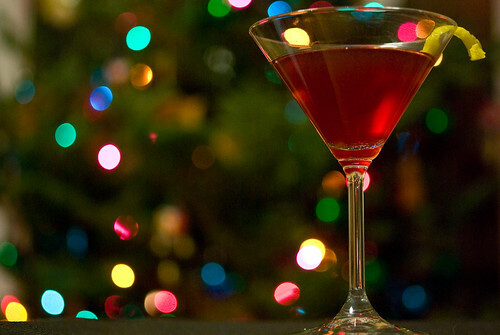 the Eggnog Martini is offered up, as well as just spiking the morning Joe. Since we're talking about it, Shawn from Rejiggered crafted a holiday cocktail that features lemon and orange sour flavors with the earthy caramel appeal of dark rum, tempered with fizzy dry champagne. I think me and this Daniel chap from Gin, Not Vodka would get along splendidly, it sounds like he likes a smokey Blood and Sand as much as I do and surmises, " I find that scotch can be easily one of the biggest hurdles for a new cocktailian, so this drink allows the drinker to come to terms with scotch and scotch cocktails in a way that is mellow, fruity and sweet enough to be accessible, but still so complex that it never loses its edge after having them time and time again. " The Opinionated Alchemist is getting sour on this months theme in a good way. Go check it out. The Maple Rare Breed Sour is all sorts of my favourite things in one glass. Ladies and Gentlemen, Start your engines! Tristan Stephenson of The Wild Drink Blog took a drink that was money to old school sailors and deconstructed it into a GT Turbo. A Mountain Of Crushed Ice made me notice one thing... the rum aficionados have some great bottles. as stated "So i want to upgrade a drink and i know what i want to make, i want to mix up the best Cuba Libre or Rum & Coke ever!" The Spiced Sugarcane Rum & Coke is the result. Speaking of rum. 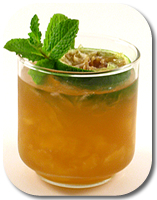 I had the fine pleasure of hanging out with Rumdood, Matt Robold last week and His entry is the 300$ Mai Tai. He says " I know it might seem a bit crazy to put such expensive rums into a cocktail, but when you consider that the original Mai Tai called specifically for Wray & Nephew 17 Year Old Rum, and that today that rum goes for about $60,000US, you’d have to say that the $300 Mai Tai is a real bargain, right?" I couldn't agree more. Dr. Bamboo writes us about the Tailspin and says " I pulled the Tailspin from the 1936 edition of the Old Mr. Boston DeLuxe Official Bar-tender's Guide and it looked like a winner: Gin, green Chartreuse, and sweet vermouth in equal proportions all topped off with a dash of orange bitters. 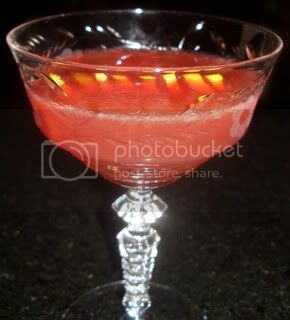 I like all those ingredients, so it was the perfect drink to spruce up with some of the spiffier denizens of my liquor cabinet. " The details of the recipe history over the years from the Mr. Boston guide is fun to see. Drinksnob purposes "Both Benedictine and Chartreuse are what I would call “problem” ingredients. Tasted by themselves they are overwhelming, especially Chartreuse. Not what you want to spring on someone, unawares. 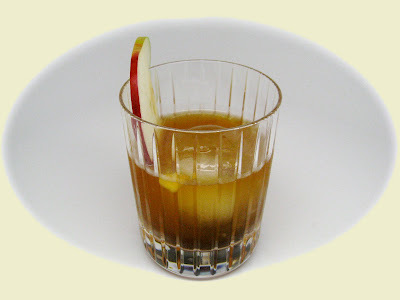 I would argue that the Widow’s Kiss is a “money drink” if there ever were one, for wrapping these difficult ingredients into a drink that somehow tastes mostly of spiced honey and the warm, slightly stuffy attic of some archetypal grandmother, comfortable and headachey, with surprises hidden around every corner." Scomorokh at Science of Drink actually surprised me with a comprehensive history on the bane of many bartenders existences, the Cosmopolitan. There's a reason its money. 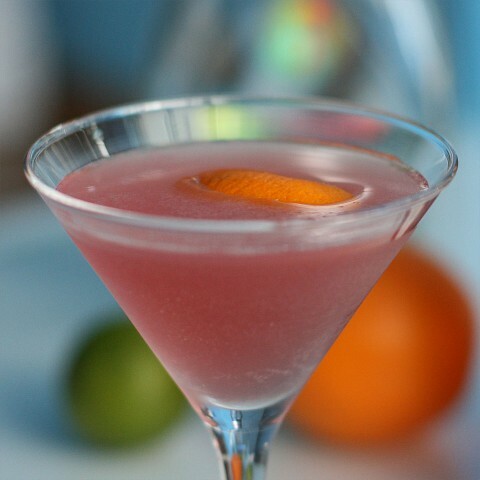 The fine folks over at Intelligent Bartender have a whole slew of great recipes and pretty pictures. Gavin states: We've got a few including but not limited to KFC Sazerac, Crown XR Manhattan with JT's Decanter Bitters and Amarena cherries + 4 more." Jacob Grier brings in the money with his H'ronmeer's Flame. There is nothing wrong with naming a cocktail after a comic reference if you ask me.